Having a medical procedure or a lab draw can be fearful for children. Even if it is their first time or they have had a bad past experience, there are ways to make these procedures easier for children. Presented by: Brad Karon, M.D., Ph.D. This "Phlebotomy" webinar will provide an introduction to cost of quality. The main components of the presentation will include discussions on the cost of attaining quality and the cost of poor quality. This “Phlebotomy” webinar will discuss how a patient’s “experience” is the entirety of all the interactions that person has had within the health care system. Each member of a health care team plays a role in enhancing patient satisfaction, which contributes to the patient experience. This "Phlebotomy" webinar will provide an update of litigation trends affecting phlebotomists. This "Phlebotomy" webinar describes the American Association of Blood Bank’s pre-transfusion standards and how they apply to a blood bank. This "Phlebotomy" webinar will provide information pertaining to the collection of arterial specimens and will focus on those collections performed for arterial blood-gas testing. This "Phlebotomy" webinar will provide the audience with a high-level understanding of the various steps of the pre-analytic processes of Mayo Medical Laboratories that lead to the timely handling of incoming specimen volumes. 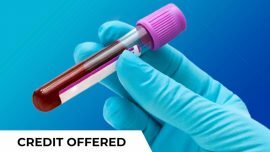 This "Phlebotomy" webinar focuses on the establishment of a formal training program for new hires and will include a discussion regarding the design of the training program to meet the needs of the organization. In this "Phlebotomy" webinar, we will discuss why quality indicators in the pre-analytical phase of testing are performed, the process of deciding what metrics to measure, and how to interpret and act on the data.